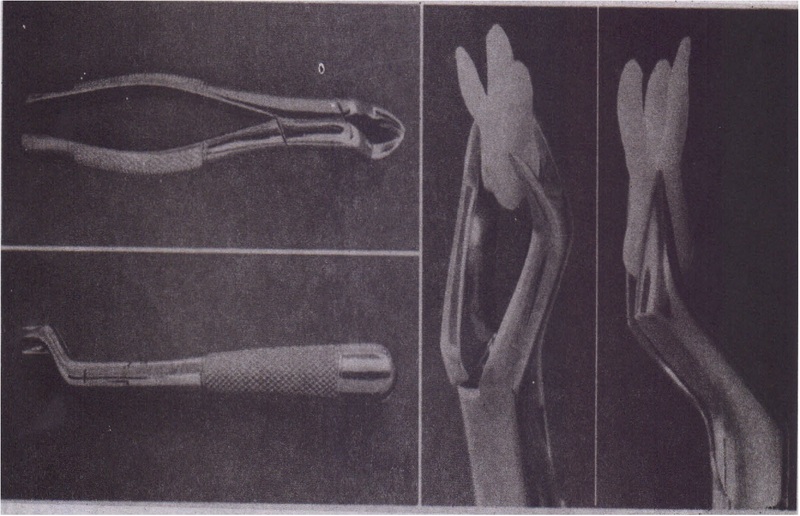 forceps adapted to maxillary .central incisor. A, .Superior view of the no. 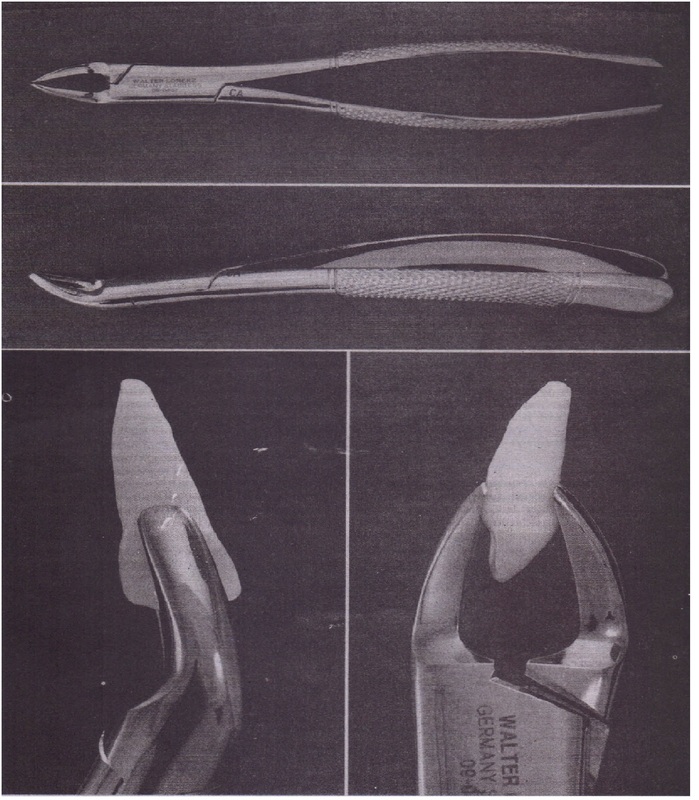 53L forceps. B, Side view of no. 53Uorceps. A, Superior view of no. 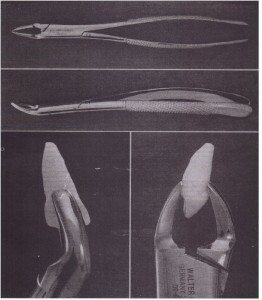 88L forceps. B, Side view of no. 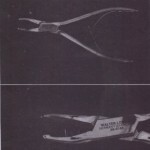 88L forceps. C, No. 88R adapted to maxiliary molar. A, Superior view of no. 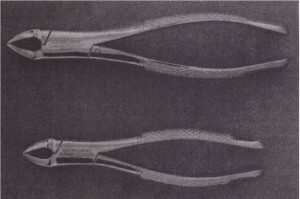 2105 forceps. B, Side view of no. 2105 forceps. C, No. 2105 adapted to maxillary molar. 6-55). These have handles similar in shape to the no. 150,but the beaks are pointed inferiorly for the lower teeth. The beaks are smooth and relatively narrow and meet only at the tip. This allow’s the beaks to fit at the cervical Iine of the tooth and grasp the root. The no. 151A forceps have been modified slightly for mandibular premolar teeth (Fig. 6-56). 1 hey should not be used for other lower teeth, because their form prevents adaptation to the roots of the teeth. 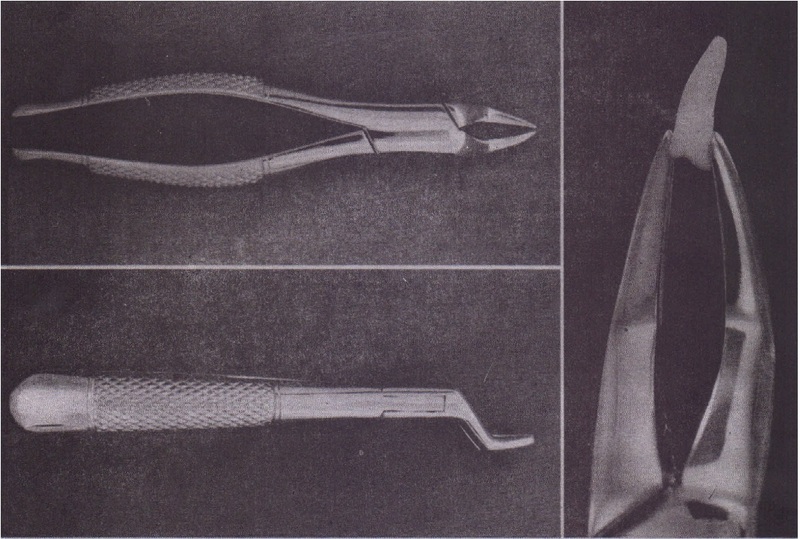 The English style of vertical-hinge forceps is used occasionally for the single-rooted teeth in the mandible (Fig.6-57). Great force can be generated with these forceps unless care is used, the incidence of root fracture is high with this instrument. 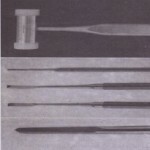 Therefore it is rarely used by the beginning surgeon. The mandibular molars are bifurcated, two-rooted teeth that allow the use of forceps that anatomically adapt to the tooth. 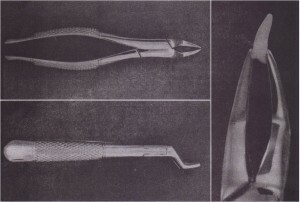 Because the bifurcation is on both the buccal and the lingual sides, only single molar forceps are necessary for the left and right, in contradistinction to the maxilla, with which a right- and left-paired molar forceps set is required. is used for primary teeth. 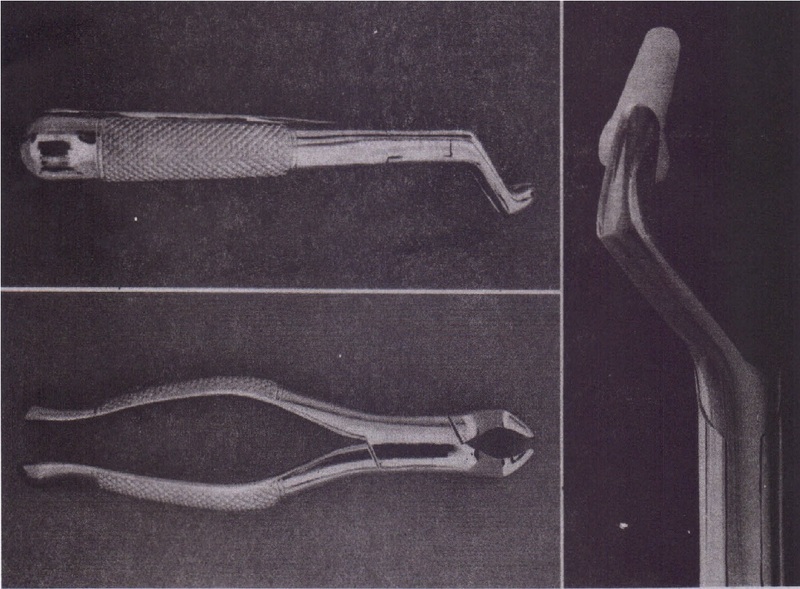 The most useful lower molar forceps are the no. 17 (Fig. 6-58). 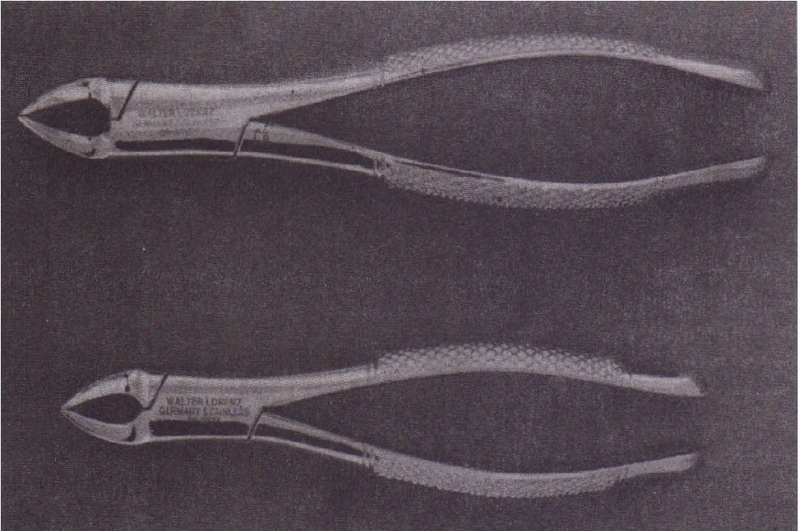 These forceps are usually straight-handled, and the beaks are set obliquely downward. The beaks have bilateral pointed tips in the center to adapt into the bifurcation of the molar teeth. The remainder of the beak adapts well to the bifurcation. Because of : he pointed tips, the no. 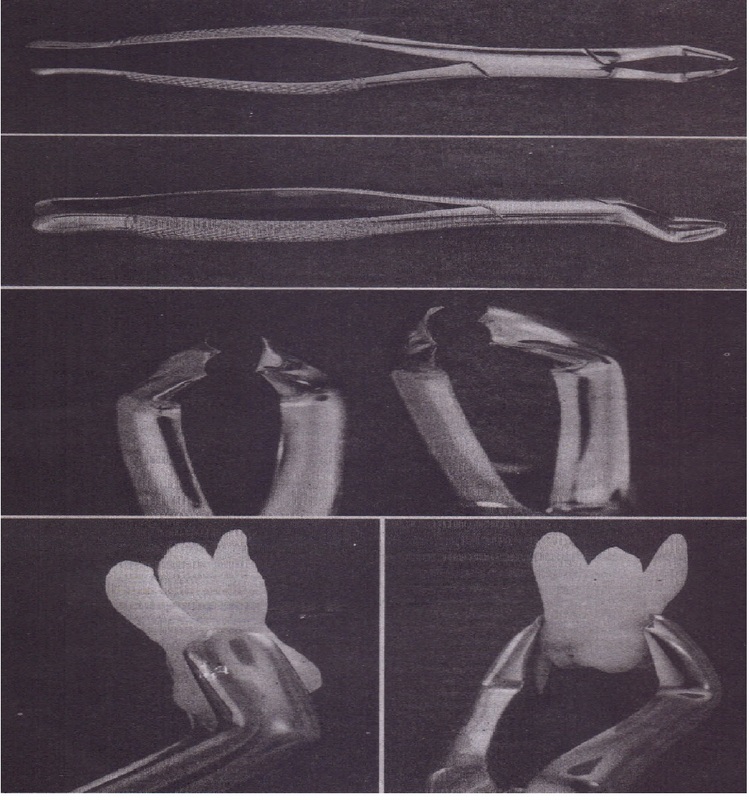 17 forceps cannot be used for molar teeth, which have fused, conically shaped roots. For this purpose the no. 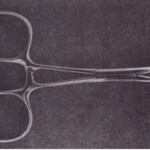 222 forceps are useful (Fig. 6- 59). They are similar in design to the no. 17, but the beaks are shorter and do not have pointed tips to prevent them from being used. The most common tooth for which the no. 222 is useful is the erupted mandibular third molar. 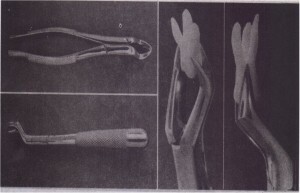 The major design variation in lower molar forceps is the no. 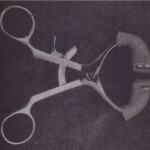 23, the so-called cowhorn forceps (Fig. 6-60). 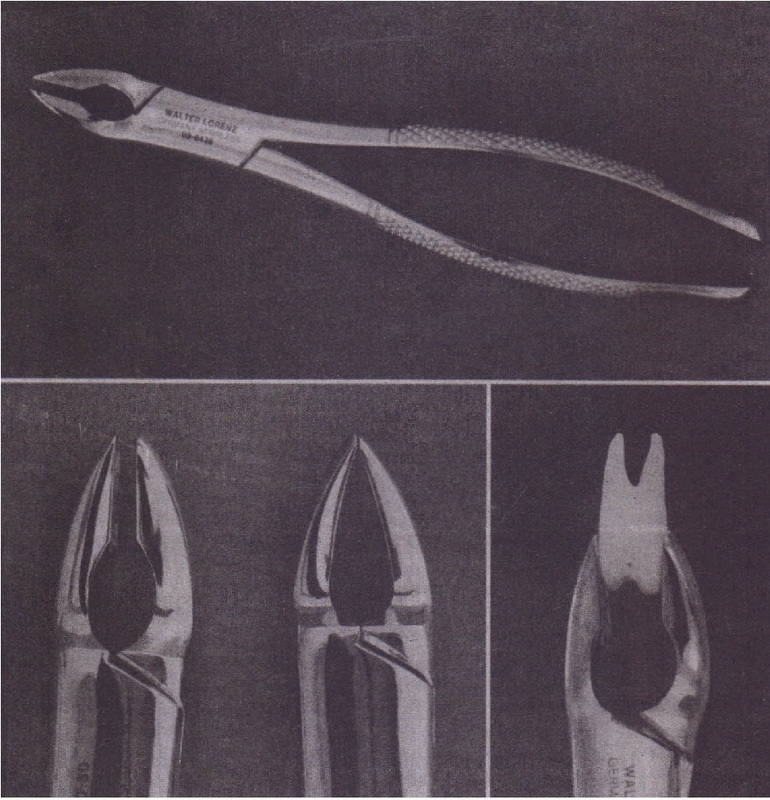 These instruments are designed with two pointed heavy beaks that enter into the bifurcation of the lower molar. 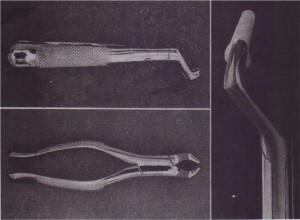 ‘After the forceps are seated into the correct position, the tooth is elevated by squeezing the handles of the forceps together tightly. 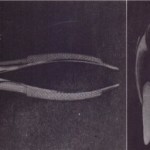 The beaks are squeezed into the bifurcation, using the buccal and lingual cortical plates as fulcrurms, and the tooth is literally squeezed out of the socket.As with the English style of forceps, improper use of “cowhorn forceps can result in an increase in. the incidence of untoward effects, such as fractures of the alveolar bone. The beginning surgeon should use cowhorn forceps with caution. The no. 151 is also adapted for primary teeth. The no. 1515 is the same general design as the no. 151 but is scaled down to adapt to the primary teeth. 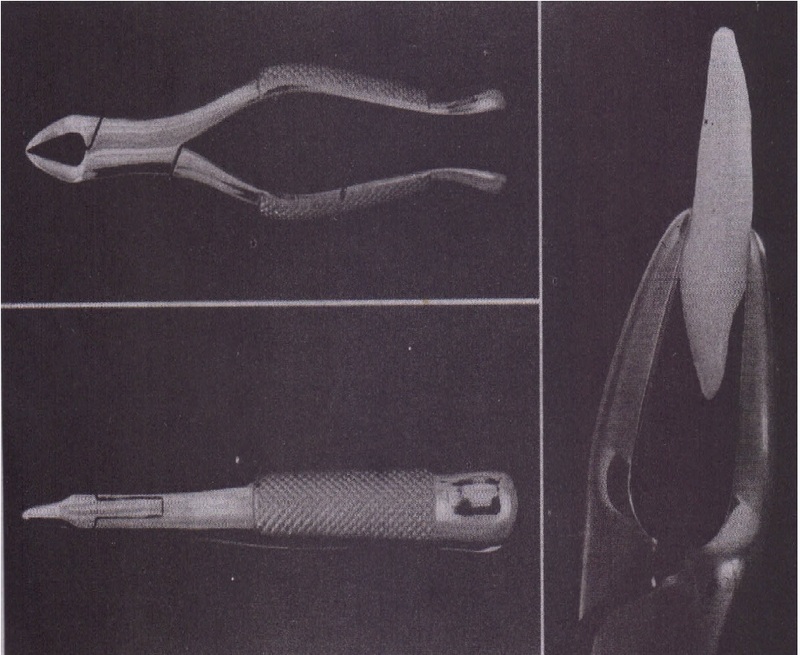 A single pair of forceps is adequate for removal of all primary mandibular teeth (Fig. 6-61).